In one of the most egregious cases, Sabal Trail commenced construction on the land of the Bell Brothers in Mitchell County, Georgia, and when they countersued, a judge ordered the landowners to pay Sabal Trail’s attorney fees. This would not have happened without FERC giving eminent domain to a private company and then allowing that company to construct without an easement agreement or payment. FERC needs to cease its practice of tolling orders or authorization for pipelines to construct without easement agreements or payment…. FERC should approve no pipeline without including in its permitting process downstream planned LNG export terminals. FERC should resume its statutorily-required oversight of inland LNG export terminals…. FERC fails to properly consider not just greenhouse gases. It also fails to consider emissionless renewable sun and wind energy while expressly comparing methane to coal for emissions, damage to farmland through erosion, destruction of terraces, runoff, topsoil and subsoil mixing, planting of invasive species as “restoration,” damage of farm equipment through improper leveling, frac-outs and sinkholes in karst terrain, leaks of toxic odorant chemicals, and of course abuse of eminent domain up to and including enabling pipeline companies to build through “stakeholder” properties before any agreement or payment is concluded, and before court cases are concluded, most obviously in the tree-cutting for the Constitution Pipeline which now even FERC declines to attempt to re-authorize. Is FERC a federal agency or an adjunct of the fossil fuel industry? Finally, FERC should cease the practice of reimbursing its annual Congressional appropriation through “Full Cost Recovery” “through annual charges and filing fees assessed on the industries it regulates as authorized by the Federal Power Act (FPA) and the Omnibus Budget Reconciliation Act of 1986.” Such a practice provides the appearance of regulatory capture and conflict of interest, which is exacerbated by FERC’s three-decade history of never denying an interstate natural gas pipeline of the Sabal Trail class, by FERC’s record of ignoring rampant abuses, some of them listed above, by its permitted pipeline operators, and most recently by FERC’s refusal to abide by its loss to Sierra Club et al. on greenhouse gases. Is FERC a federal agency working for the people of the United States of America, or is it beholden to the pipeline companies and their affiliate customers? It is time to decide. I am writing in response to the Federal Energy Regulatory Commission’s Notice of Inquiry (NOI) requesting information and stakeholder perspective to help the Commission revise its outdated approach on the certification of new natural gas transportation facilities to determine whether a proposed natural gas project is or will be required by the present or future public convenience and necessity, as that standard is established in section 7 of the Natural Gas Act. FERC must revise its current policy to give much more robust consideration when it makes public necessity and convenience determinations to factors such as environmental impacts, including emissions of climate pollution, and private property rights. For decades, FERC has grossly overweighed economic factors in its analysis, which has benefited a relatively small number of gas and pipeline companies at the expense of millions of Americans who depend upon clean air and water and a safe climate for themselves and future generations. Additionally, FERC must fix its outrageous practice of issuing conditional certificates of public convenience and necessity — allowing pipeline companies to condemn private property through eminent domain — and then using “tolling orders” to avoid timely ruling on requests for rehearing. This practice unfairly locks landowners out of courthouses across the country and denies them due process to protect their private property from condemnation by for-profit companies. Our property rights are protected under our Constitution, and FERC must end this unamerican and unfair practice once and for all! Eminent domain should only be authorized, if at all, after a company has obtained every authorization required under the law. The detailed comments of WWALS on the following pages are organized according to the categories requested in the NOI. It is time for FERC to stop favoring a few pipeline and utility companies and to stop shirking its duties to the public and to the environment. The NOI fails to request public input on methodology for determining public benefit, not just need. Florida Southeast Connection, LLC, 162 FERC ¶ 61,223, at 6 (2018) (Glick, Comm’r, dissenting). That last one, for Florida Southeast Connection, was the Order in which FERC reinstated certificates for all three of FSC, Sabal Trail,and Hillabee Expansion Project. PennEast Pipeline Company, LLC, 162 FERC ¶ 61,053 (2018) (Glick, Comm’r, dissenting). Columbia Gas Transmission, LLC, 164 FERC ¶ 61,036 (19 July 2018) (Glick, Comm’r, dissenting). Texas Eastern Transmission, LP, 164 FERC ¶ 61,037 (19 July 2018) (Glick, Comm’r, dissenting). Northwest Pipeline LLC, 164 FERC ¶ 61,038 (19 July 2018) (Glick, Comm’r, dissenting). Commissioner Cheryl LaFleur dissented in whole or part on most of the above FERC Orders. Presumably FERC knows which of its own Commissioners dissented on what, but the general public may not be aware that two Commissioners have been dissenting on nearly every FERC pipeline Order this year. And in most of those dissents they explicitly cite Sierra Club v. FERC (Sabal Trail). I believe the fact pattern presented in this case, a pipeline designed to serve a specific known downstream powerplant, falls squarely within the precedent of Sierra Club v. FERC.1 Given that the majority’s analysis here suffers from the same flaws as its decision on remand in Sabal Trail,2 I respectfully dissent..
1 867 F.3d 1357 (D.C. Cir. 2017) (Sierra Club). Without adequately considering detriments to the public including greenhouse gases, FERC cannot balance those with any alleged need, and thus cannot determine public benefit. FERC should stop approving any pipelines or LNG export terminals until it is willing to do its statutory duty. 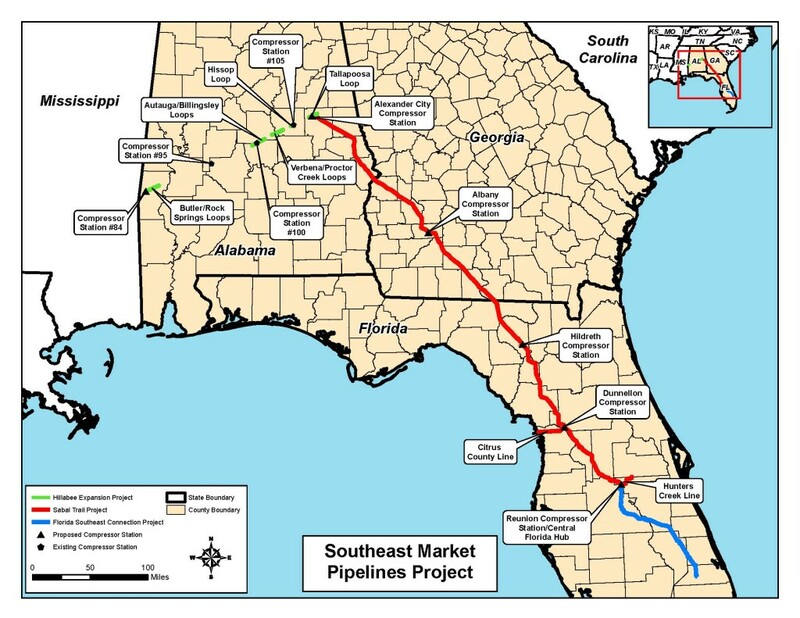 The alleged “need” for the Southeast Markets Pipeline Project (SMPP) through Alabama, Georgia, and Florida, was determined by the Florida Public Service Commission (FPSC) in Tallahassee, Florida,2 and by FERC in Washington, DC in Florida Southeast Connection, LLC, 154 FERC ¶ 61,080 (2 February 2016),3 with no deciding body in Alabama or Georgia, despite SMPP including the Hillabee Expansion Project in Alabama and the Sabal Trail pipeline through eastern Alabama and southwest Georgia. As recently as the 26 June 2018 eminent domain jury trial in Valdosta, Georgia, of Sabal Trail against a defendant in Moultrie, Georgia,4 I heard the judge5 remind everyone that “need” had been decided long ago, i.e., by FERC and FPSC. A jury of that landowner’s peers was not allowed to even discuss need or environmental issues, nor did any court or commission or council or legislature in Georgia or Alabama get to make any decisions on that alleged “need”. FERC should approve no pipeline without explicit positive approval of every state public service commission, city council, county commission, state legislature, and native American governing body, through whose territory such a pipeline would run. Such an ideal situation may not be possible without changes in current laws, but FERC needs to follow existing laws, and that will get much closer to that ideal. If such a rule would mean no new interstate natural gas pipelines would be built, remember solar and wind power have no such difficulties. “In today’s order, the Commission relies exclusively on the existence of precedent agreements with shippers to conclude that the PennEast Project is needed.2 Pursuant to these agreements, PennEast’s affiliates hold more than 75 percent of the pipeline’s subscribed capacity.3 While I agree that precedent and service agreements are one of several measures for assessing the market demand for a pipeline,4 contracts among affiliates may be less probative of that need because they are not necessarily the result of an arms-length negotiation.5 By itself, the existence of precedent agreements that are in significant part between the pipeline developer and its affiliates is insufficient to carry the developer’s burden to show that the pipeline is needed. 2 PennEast Pipeline Company, LLC, 162 FERC ¶ 61,053, at P 27 (2018) (explaining that “it is current Commission policy to not look beyond precedent or service agreements to make judgments about the needs of individual shippers”); id. P 29 (“Where, as here, it is demonstrated that specific shippers have entered into precedent agreements for project service, the Commission places substantial reliance on those agreement to find that the project is needed.”). 4 Certification of New Interstate Natural Gas Pipeline Facilities, 88 FERC ¶ 61,227, 61,747 (1999) (Certificate Policy Statement) (“[T]he Commission will consider all relevant factors reflecting on the need for the project. These might include, but would not be limited to, precedent agreements, demand projections, potential cost savings to consumers, or a comparison of projected demand with the amount of capacity currently serving the market.”). 5 Certificate Policy Statement at 61,744. 7 Indeed, the Commission concludes that “the fact that 6 of the 12 shippers on the PennEast Project are affiliated with the project’s sponsors does not require the Commission to look behind the precedent agreements to evaluate project need.” PennEast Pipeline Company, LLC, 162 FERC ¶ 61,053 at P 33. Also in the same Plan, FPL admitted admitted that efficiency, conservation, and solar power were making great strides, and that all of the coal plants it supposedly needed Sabal Trail’s gas to “modernize” as natural gas power plants had already been converted. Instead of admitting these things to FERC, FPL has introduced a different set of power plants as the supposed need for Sabal Trail. FERC should approve no more pipelines without comparing not just coal plants to natural gas plants, but also comparing sun and wind power. If that means no more pipelines, so be it. It does not say private property may be taken by a private company before even any agreement for compensation, yet that is what FERC has authorized for many pipelines regarding many landowners. In one of the most egregious cases, Sabal Trail commenced construction on the land of the Bell Brothers in Mitchell County, Georgia, and when they countersued, a judge ordered the landowners to pay Sabal Trail’s attorney fees.8 This would not have happened without FERC giving eminent domain to a private company and then allowing that company to construct without an easement agreement or payment. FERC needs to cease its practice of tolling orders or authorization for pipelines to construct without easement agreements or payment. Sabal Trail contended that there are no damages to market value based on market fear or stigma. …the jury rendered a verdict in the amount of $309,500. This, of course, is over five-times the amount offered by Sabal…. In the Valdosta case, the judge did not let the defense attorney discuss nor the jury hear anything about market fear or stigma. Nonetheless, that jury of a landowners’ peers decided, just like the earlier one, to award five times what Sabal Trail offered. If a jury of a landowners’ peers can discern this, FERC’s jury of five Commissioners should be able to: eminent domain dispensed by FERC is enabling private pipeline companies to take land without adequately compensating the landowners not only for the market value of the specific easement acreage, but for further damages beyond that. FERC should direct pipeline companies to take damages to market value and stigma into account in easement compensation. The contractor is funded by the applicant and works at our direction. There have been numerous allegations12 of conflict of interest13 on the part of such contractors for FERC. FERC by hiding its own RFPs is doing nothing to dispel an impression of conflicts of interests not just on the part of the contractors but by FERC itself. FERC should publish its RFPs for contractors, plus the proposals received from applicants, and the correspondence in choosing a contractor. FERC’s oversight of Sabal Trail’s path through farming and ranching operations was seriously lacking. See for example the case of Brooks County, Georgia, farmer Randy Dowdy, the world record holder in soybean yield. Sabal Trail gouged through exactly those soybean fields, destroyed Dowdy’s terraces, let topsoil run off into nearby wetlands, and mixed topsoil and subsoil.14 Only Dowdy’s phenomenal persistence has gotten FERC to require Sabal Trail to look into those problems on his property and that of several other landowners. Yet Sabal Trail has nothing to address the generational damage it has done. One can only wonder how many more cases of agricultural damage Sabal Trail has inflicted with FERC doing nothing to stop it. FERC should approve no more pipelines through agricultural land without real oversight by agricultural experts who are not employees or contractors of the pipeline companies. 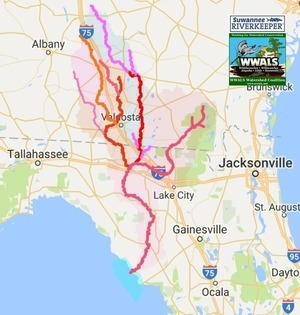 WWALS has repeatedly informed FERC of violations such as a frac-out from Sabal Trail’s pilot hole under the Withlacoochee River in Georgia and numerous sinkholes in Georgia and Florida, despite Spectra executives and the one witness for the Florida Department of Environmental Protection (FDEP) witness saying under oath in WWALS vs. Sabal Trail & FDEP (2015) that it would not happen.16 We will not review all of this again here; search for WWALS in FERC Docket CP15-17, or a summary is provided at the previous footnote. Greenhouse Gases (GHG) and Sierra Club v. FERC (Sabal Trail). See 1: Methodology for Determining Need for numerous dissents by FERC Commissioners Glick and LaFleur on lack of determination of Greenhouse Gasses as greatly detracting from FERC’s ability to balance environmental hazards against alleged need. This problem is especially egregious when, as Commissioner Glick points out, in for example PennEast Pipeline Company, LLC, 162 FERC ¶ 61,053 (2018), that a given pipeline’s “market” consists mostly or even wholly of its own affiliates. “In this case, the Commission quantified and disclosed the upper-bound estimate of the downstream greenhouse gas (GHG) emissions associated with the North Seattle Project.1 The volume of GHG emissions associated with the downstream use would result in about 4.1 percent increase in GHG emissions in Washington2 and a 0.05 percent increase of national GHG emissions.3 Going forward, at a minimum, I believe we should continue to do this GHG quantification and analysis as part of our environmental review of pipeline projects. I recognize that this full-burn estimate is simply a mathematical derivative of pipeline volume, but I believe we should disclose it and consider it as part of my public interest determination, particularly where there is not more precise evidence of downstream pipeline utilization. In the future, more information in the record regarding the identified end uses would enable the Commission to more accurately assess indirect impacts of downstream GHG emissions by calculating gross and net GHG emissions as part of our National Environmental Policy Act (NEPA) responsibilities. “As for the upstream impacts associated with the North Seattle Project, the order does not respond to intervenors concerns to include even the generic upstream information we have been disclosing since 2016.4 I do not support this decision. While it is less clear that upstream effects are caused by the pipeline, I would respond to upstream GHG comments by disclosing the best available information, such as the DOE studies cited in past orders. However, today’s order rejects that approach, and applies the Commission’s new policy that limits the review and disclosure of upstream and downstream GHG impacts as part of our NEPA responsibilities and public interest determination under the Natural Gas Act (NGA).5 I note my continuing strong disagreement with this change in policy. 1 The EA includes an estimate of the upper-bound downstream GHG emissions based on the project transporting up to 196,311 dekatherms per day (Dth/d). However, Northwest revised its application reducing the incremental capacity of natural gas delivered by Northwest’s system to 159,299 Dth/d. Using the projects revised capacity, if all 159,299 Dth/d of natural gas were transported to combustion end uses, downstream end use would result in the emissions of about 3.1 million metric tons of CO2e. 2 U.S. Energy Information Administration, https://www.eia.gov/environment/emissions/state/analysis/ October 14, 2017. The Washington Dept. of Ecology commented on the EA stating that Commission staff should have used Washington Dept. of Ecology’s statewide emissions inventory to calculate the statewide percentage increase. Using their data, there would be a 3.3 percent increase in GHG emissions in Washington. Washington Department of Ecology, https://fortress.wa.gov/ecy/publications/documents/1602025.pdf, October 2016. 3 U.S. Environmental Protection Agency, Inventory of U.S. Greenhouse Gas Emissions and Sinks: 1990–2016, April 12 2018. One way the Commission could assess the significance of a given rate or volume of GHG emissions is to compare the downstream GHG emissions associated with an individual project to the total state, regional, and/or national emission inventories. 4 The Commission has relied on recent DOE studies to provide generic estimates of impacts associated with upstream natural gas production, including production related GHG emissions. Commission orders that contained this generic upstream information acknowledged the limitations of providing such data because we did not have more detailed information such as the number, location, and timing of the wells, roads, and gathering lines as well as details about production methods. Dep’t of Energy and Nat’l Energy Tech. Laboratory, Life Cycle Analysis of Natural Gas Extraction and Power Generation, DOE/NETL-2015/1714 (Aug. 30, 2016) (2016 DOE/NETL Study); U.S. Energy Info. Admin., The Growth of U.S. Natural Gas: An Uncertain Outlook for U.S. and World Supply (June 15, 2015), http://www.eia.gov/conference/2015/pdf/presentations/staub.pdf; Dep’t of Energy and Nat’l Energy Tech. Laboratory, Environmental Impacts of Unconventional Natural Gas Development and Production,DOE/NETL-2014/1651, (May 29, 2014) (2014 DOE/NETL Study). 5 See Dominion Transmission Inc., 163 FERC ¶ 61,128 (2018) (LaFleur, Comm’r, dissenting in part) (New Market). Commissioner LaFleur’s statement is evidence that FERC can, indeed, quantify and account for greenhouse gases: it just chooses not to. However, Commissioner LaFleur’s concurrence in Northwest Pipeline LLC, 164 FERC ¶ 61,038 (19 July 2018), in considering only a “full-burn estimate” of “combustion end uses” of “downstream greenhouse gas (GHG) emissions” fails to consider leaks and explosions. Methane is a far more potent greenhouse gas than carbon dioxide,18 so even small amounts of it leaking directly into the atmosphere should be a big concern. FERC should do the job mandated by the court: the full job, not just some small part of the job. 16. Commenters raised many issues that are outside the scope of the SEIS and the court’s mandate, including: GHG emissions from upstream production of natural gas; project impacts to wetlands, threatened and endangered species, groundwater, and real property; noise; safety of pipelines constructed in karst areas; environmental justice; project need; LNG exports; landowner notification; project’s effect on the supply and demand for natural gas and substitute energy sources; and public participation. The Commission will not address these arguments because the Commission already thoroughly considered them in the Certificate and Rehearing Orders and the court either specifically affirmed these arguments or did not remand them to the Commission for further consideration. We address the relevant comments below. 65 Section 3(a) of the NGA provides, in part, that “no person shall export any natural gas from the United States to a foreign country or import any natural gas from a foreign country without first having secured an order of the Commission authorizing it to do so.” 15 U.S.C. § 717b(a) (2012). In 1977, the Department of Energy Organization Act transferred the regulatory functions of section 3 of the NGA to the Secretary of Energy. 42 U.S.C. § 7151(b) (2012). Subsequently, the Secretary of Energy delegated to the Commission authority to “[a]pprove or disapprove the construction and operation of particular facilities, the site at which such facilities shall be located, and with respect to natural gas that involves the construction of new domestic facilities, the place of entry for imports or exit for exports.” DOE Delegation Order No. 00-004.00A (effective May 16, 2006). The proposed facilities are not located at a potential site of exit for natural gas exports. Moreover, the Secretary of Energy has not delegated to the Commission any authority to approve or disapprove the import or export of the commodity itself, or to consider whether the exportation or importation of natural gas is consistent with the public interest. See Corpus Christi Liquefaction, LLC, 149 FERC ¶ 61,283, at P 20 (2014) (Corpus Christi). See also National Steel Corp., 45 FERC ¶ 61,100, at 61,332-33 (1988) (observing that DOE, “pursuant to its exclusive jurisdiction, has approved the importation with respect to every aspect of it except the point of importation” and that the “Commission’s authority in this matter is limited to consideration of the place of importation, which necessarily includes the technical and environmental aspects of any related facilities”). Environmental aspects would include greenhouse gases, leaks, and explosions, yet FERC refuses to consider those even for LNG export terminals whose own applicants to FERC or to the U.S. Department of Energy Office of Fossil Energy (FE) name Sabal Trail as a source of gas. This refusal omits numerous overseas burn points of the fracked methane. FERC has claimed that its “full-burn estimate” covers LNG export. Even that claim overlooks lack of U.S. state or federal oversight over quality of burn at overseas sites. Further, FERC ignores additional opportunities for leaks and explosions in getting the gas to the LNG export terminals through additional pipelines and connecting points, in loading LNG into containers and onto trucks, railcars, and ships, and in transporting the LNG by truck, rail, and ship. In Florida Gas Transmission Company, LLC, "ORDER ISSUING CERTIFICATE," 154 FERC ¶ 61,256 (30 March 2016),20 FERC permitted Kinder Morgan’s Jacksonville Expansion Project (JEP) of its Florida Gas Transmission (FGT) pipeline from Sabal Trail in Suwannee County, Florida to Jacksonville, Duval County, Florida. In Jacksonville, JEP would probably feed Eagle LNG, which is still in FERC’s permitting process.21 WWALS has repeatedly22 spelled out this connection to FERC,23 but FERC has not addressed it, even though a Metering and Regulation (M&R) station was built into Sabal Trail’s plans24 for the JEP connection location early in Sabal Trail’s FERC permitting process, as in the Sabal Trail alignment map shown below..
FERC should approve no pipeline without including in its permitting process all planned related pipelines, especially those that lead to LNG export terminals. Strom LNG in its applications to the U.S. Department of Energy’s Office of Fossil Energy to locate first in Starke, Florida, and now in Crystal River, Florida25 has consistently said Sabal Trail is one of its likely sources of gas. Yet Sabal Trail and FERC have consistently denied any connection. Strom even opened a FERC docket in 201426 while FERC was still holding Scoping Meetings on Sabal Trail, yet FERC and Sabal Trail never mentioned any connection. FERC even decided in Pivotal LNG, Inc., 151 FERC ¶ 61,006, (2 April 2015) not to oversee inland LNG export terminals,27 over the dissent of then-Commissioner Norman Bay, who spelled out how that FERC decision did not follow NGA nor NEPA. FERC thus shirks its LNG oversight duty in several ways, including not overseeing inland LNG terminals. FERC should resume its statutorily-required oversight of inland LNG export terminals. Public confidence in the Commission’s approach to considering applications for interstate gas pipeline certificates of public convenience and necessity continues to wane.30 I fear that today’s order, by limiting analysis of the environmental impacts of a proposed pipeline, will both increase the Commission’s litigation risk and contribute further to the cynicism of the pipeline siting process. 30 Masslive, U.S. Sen. Elizabeth Warren pushes bill to boost public access to FERC proceedings (May 2017), http://www.masslive.com/politics/index.ssf/2017/05/us_sens_elizabeth_warren_and_j.html. Since Commissioner Glick is new to FERC, he may not be aware that the public has long since gone far beyond cynicism into clear-eyed condemnation of FERC’s processes. 85. … Because the Okeechobee Clean Energy Center is not an existing plant, whether the Florida Power Service Commission approves the plant does not bear on Florida Power & Light’s specified demand for the Sabal Trail and Florida Southeast Projects set forth in its application. “In this case, I have considered the GHG emissions for the Okeechobee Lateral Project by comparing the emissions estimates to the total state and national emission inventories and calculating how this project increases those GHG inventories. I do not think we should shirk our responsibilities under the Natural Gas Act and NEPA by refusing to determine the significance of GHG emissions simply because consideration of climate change in our pipeline review is difficult. Indeed, in the same concurrence, Commissioner LaFleur said she thought she had balanced “the need for the project and its environmental impacts.” In that she appears to be in error, because without FERC accounting for GHG, the environmental impacts were not quantified and therefore could not be balanced. Furthermore, neither she nor the rest of the FERC Commissioners considered renewable solar or wind power instead of a natural gas power plant, which would have greatly reduced the environmental impacts, and probably completely removed any “need” for the pipeline. 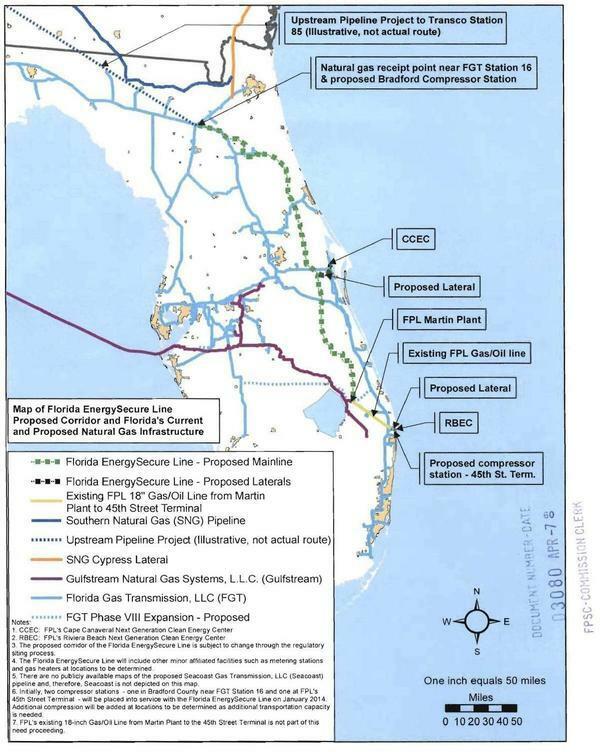 Worse, Florida Power & Light (FPL) asked FPSC to roll FPL’s Martin County to Riviera Beach Martin-Riviera Natural Gas Pipeline Lateral (MR-RV) pipeline into Florida Southeast Connection (FSC),34 even though MR-RV was not part of the SMPP FERC permit process. FPSC has already approved that transfer35 and closed its docket,36 so MR-RV has been added to FSC with no FERC oversight as to environmental issues nor any other adverse effects. 15 Certificate Policy Statement, 88 FERC ¶ 61,227 at p. 61,745. The Facilities are existing pipeline, compression and appurtenant facilities currently owned by FPL. 16 No landowner notification is required under 18 CFR §157.6(d)(1) given that the Acquisition involves existing facilities that will continue to be utilized to transport natural gas. FPL has filed for authorization with the Florida Public Service Commission for the acquisition. Upon acquisition of the facilities, FSC would provide FERC jurisdictional open-access firm and interruptible service on the facilities. FERC has not issued any Order in this docket, even though FPSC has approved rolling MR-RV into FSC. Maybe the above quote indicates that FERC has completely handed over approval to FPSC. In any case, FERC has completely sidestepped environmental assessment of MR-RV. MR-RV was built before FSC was permitted by FERC,38 so clearly FERC must have known about it. In recent documents FERC even refers to FPL’s Martin-Riviera power plant as one of the main consumers of gas from FSC through Sabal Trail, and that gas is very likely getting there through MR-RV. 6 FPSC Order No. PSC-09-0715-FOF-EI, In re: Petition to determine need for Florida EnergySecure Pipeline by Florida Power & Light Company at 5, FPSC Docket No. 090172-EI (issued October 28, 2009). 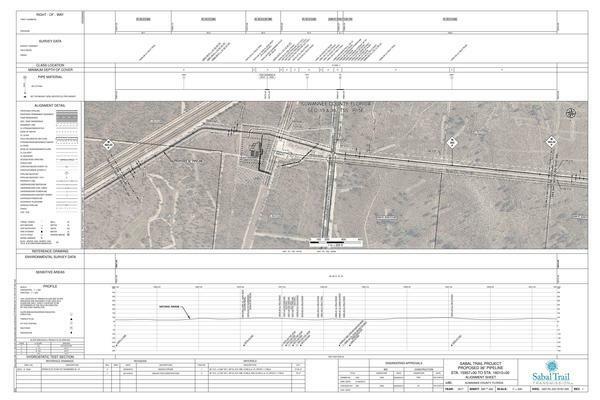 Shown on the right here is the map39 FPL submitted to FPSC in 2009 with its EnergySecure pipeline application. 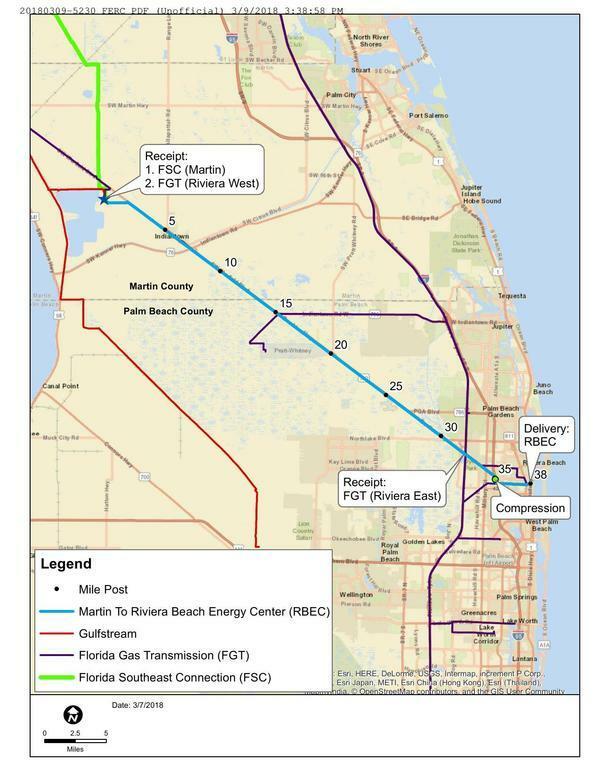 It lists a “proposed lateral” going to “RBEC: FPL’s Riviera Beach Next Generation Clean Energy Center,” which is the same destination as FPL’s later MR-RV pipeline. This would appear to be evidence that FPL and FERC knew all along that MR-RV was actually part of the SMPP project, even though FERC did not consider MR-RV in its permitting process for SMPP. The instant docket is the culmination of a process, which began in 2009 when FPL petitioned us to develop, build, and operate the Florida EnergySecure Line. On April 7, 2009, FPL filed its petition in Docket No. 090172-EI requesting a determination of need for its proposed Florida EnergySecure Line, a 280-mile long, 30-inch diameter high pressure natural gas transmission pipeline that FPL sought to own and operate primarily for supplying natural gas to its newly modernized Cape Canaveral and Riviera Beach generating units. For the reasons explained below, we deny FPL’s petition. Our decision is based upon our analysis of the record evidence, our analysis of the arguments raised, our deliberation at our October 6, 2009, Agenda Conference, and our determination that FPL has not adequately demonstrated that its EnergySecure pipeline is the most cost-effective alternative to provide natural gas transmission capacity. We direct FPL to issue a new Request for Proposals (RFP) to fill FPL’s natural gas transmission requirements. The results of the RFP will provide a market proxy against which we will be able to measure the cost-effectiveness of proposed projects to meet FPL’s need for transmission capacity. The terms of the RFP shall be reviewed by our staff before it is issued. The RFP FPSC directed FPL to issue is the same in the quote above from Florida Southeast Connection, LLC, 154 FERC ¶ 61,080 (2 February 2016). If FPL’s Florida EnergySecure Line is approved, the new pipeline would be in service by January 2014. The pipeline would add a third natural gas supply pipeline in the state…. Environmental impacts and other issues related to the proposed pipeline will be considered by other agencies. In the determination of need, the commission shall take into account the need for natural gas delivery reliability, safety, and integrity; the need for abundant, clean­ burning natural gas to assure the economic well-being of the public; the appropriate commencement and terminus of the line; and other matters within its jurisdiction deemed relevant to the determination of need. FERC failed to include FPL’s Martin-Riviera Lateral (MR-RV) in its SMPP permitting, FERC did not even have any part in FPSC rolling MR-RV into FSC, and FERC depended far too heavily on FPSC and FPL in determining need, despite FPSC not evaluating environmental factors. See above about in 3: Environmental Impact about the FGT Jacksonville Expansion Project from Sabal Trail in Suwannee County, Florida, to Jacksonville, which had an M&R station in Sabal Trail’s plans from early in Sabal Trail’s FERC permitting process. At least three laterals have been added to SMPP after its FERC approval: JEP, the Okeechobee Lateral, and MR-RV. None of these took into account greenhouse gases as required by Sierra Club v. FERC (Sabal Trail), and FERC even gave MR-MV a categorical exclusion from consideration of all environmental matters. FERC should approve no pipeline without including all of its intended laterals. FERC’s GHG accounting for pipelines could change through its review of its approval policies, which McIntyre said would likely not be completed by the time Powelson steps down. Comments in the docket are due next week. As documented repeatedly by Commissioners LaFleur and Glick, FERC continues to fail in its greenhouse gas accounting duties even after declining to appeal its loss on that point in court to Sierra Club. FERC must stop approving pipelines until it can do what the court ordered. Finally, FERC should cease the practice of reimbursing its annual Congressional appropriation through “Full Cost Recovery” “through annual charges and filing fees assessed on the industries it regulates as authorized by the Federal Power Act (FPA) and the Omnibus Budget Reconciliation Act of 1986.”45 Such a practice provides the appearance of regulatory capture and conflict of interest, which is exacerbated by FERC’s three-decade history of never denying an interstate natural gas pipeline of the Sabal Trail class, by FERC’s record of ignoring rampant abuses, some of them listed above, by its permitted pipeline operators, and most recently by FERC’s refusal to abide by its loss to Sierra Club et al. on greenhouse gases. 16 "Sabal Trail violations FDEP assured us would not happen are happening," John S. Quarterman, WWALS, 11 December 2016, http://wwals.net/?p=27799, includes excerpts from transcripts of WWALS vs. Sabal Trail & FDEP (2015). 28 See FERC’s own transcripts, or “Water and family farms more precious than Sabal Trail Sinkhole Pipeline: citizens to FERC in Moultrie 2015-09-29,” John S. Quarterman, WWALS, 30 September 2018, http://wwals.net/?p=12296, which includes LAKE videos of what was said. 29 See FERC’s own transcripts, or "Insanity: Sabal Trail pipeline in karst sinkhole Floridan Aquifer @ FERC Lake City 2015-10-01," John S. Quarterman, WWALS, 2 October 2015, http://www.l-a-k-e.org/blog/?p=14532, includes links to LAKE videos of what was said.